Since upgrading to WebStorm 6, multiples of us here are having issues with node.js breakpoints. In particular, the first time you debug, your breakpoints are hit. But if you try and debug again (without restarting WebStorm) the only breakpoint that gets triggered is one on the very first line of code (all other breakpoints are skipped). However, if you stop and restart WebStorm, breakpoints work again - but only the first time you debug after restarting. >> But if you try and debug again (without restarting WebStorm) the only breakpoint that gets triggered is one on the very first line of code (all other breakpoints are skipped). Do you mean start the new debug session (rerun run configuration)? I noticed the same issues when i have IDEA 12 running in the background too. I hit this with WebStorm 6 as well. Using 'debugger;' in my code does seem to cause a breakpoint though! Hope that's some help. Yes, once the current debug run stops, and I try and start debugging again (either via the debug button in the top toolbar, or via the rerun button on the debug tab), breakpoints no longer work (other than a breakpoint on line #1 of the main program). I'm running a webapp, which run over Yeoman. The app broke only once for me at the breakpoints. Even after restarting it never stopped again, but console logs do printing to the console from the same break area (function scope). Now I discovered that the Chrome Extension stop working, and I have no idea when and what triggers it, but it happened few times. After reinstalling the extension, the extension returns to communicate with the IDE. Interesting point is that (i have no idea how relevant or how much it will help), the extension forget the port I defined in it, but he still works. I am having this problem as well. 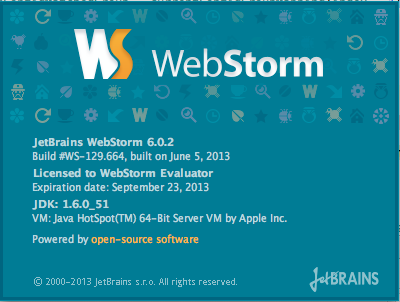 I've confirmed in both in Webstorm 6 and pycharm 2.6.3 on OSX. Any word on a fix? I'm getting a little desperate.Why on earth is this marked as possibly fixed? I've verified that there are no symlinks in my project path. So, it would seem that WebStorm is not actually sending the breakpoint commands to node all the time. --> Is there a way to print debug output (either from node or from WebStorm) that shows the exact debug commands being sent to node? I believe I've isolated the cause of the bug. It appears that node (at least with node v0.6.21) needs some time to finish starting up before it can properly accept debug commands from WebStorm (and maybe WebStorm is sending them differently the first time node is run versus on subsequent runs). Below is both an (ugly) workaround and a test case that lets me toggle the bug on and off. Basically the workaround inserts a proxy between node and WebStorm, giving node time to startup before it begins sending the connections from WebStorm through. Install socat if you don't already have it (e.g. "brew install socat"). With this proxy in place, breakpoints are reliably hit every time. However, if you remove the "sleep 1" (so the port is opened to node right away) the problem of only the first breakpoint in the file being hit reappears. Note that, with this proxy in place, debug sessions will never terminate on their own - you will always need to hit the "stop" button. I'm experiencing the same issue running version 6.0.2 on Mac OS X, it's there any other solution than using a proxy to node.js?